EDIT: More info on this crazy cover. “Conan the Cimmerian” #25 will actually be a full-tilt celebration of Conan the character, rather than a funeral dirge for “Conan the Cimmerian,” the comic-book series that's ending. In addition to Geof's stunning wraparound cover, we're going to have at least a dozen pinups from professional artists, and we'll have limited ad pages. Conan fans such as Jeffrey Brown (“Clumsy, Little Things”), Rob Guillory (“Chew”), Art Baltazar (“Tiny Titans”), Dean Haspiel (“Billy Dogma”), Farel Dalrymple (“Pop Gun War”, “Omega”), and Dan Hipp (“Amazing Joy Buzzards!,” “Ben 10”) were all eager to show off their admiration for Howard's tenacious barbarian with unique illustrations that will leave our readers intrigued and craving more! “Cimmerian” #25 also features the final chapter in our "Iron Shadows in the Moon" story adaptation by Tim Truman, Tomás Giorello, and José Villarrubia -- who will be starting their work on “King Conan: The Scarlet Citadel” just as soon as their final pages for “Cimmerian” are in. In our last “Cimmerian” story arc, we're weaving in some characters who will be present in the “Conan: Road of Kings” series, so there will be some "connective tissue" shared between “Conan the Cimmerian” #25 and “Conan: Road of Kings” #1. “Road of Kings” #1 will pick up where “Cimmerian” #25 left off (but with an entirely new creative team), and the new series will continue to tell Conan's life story. 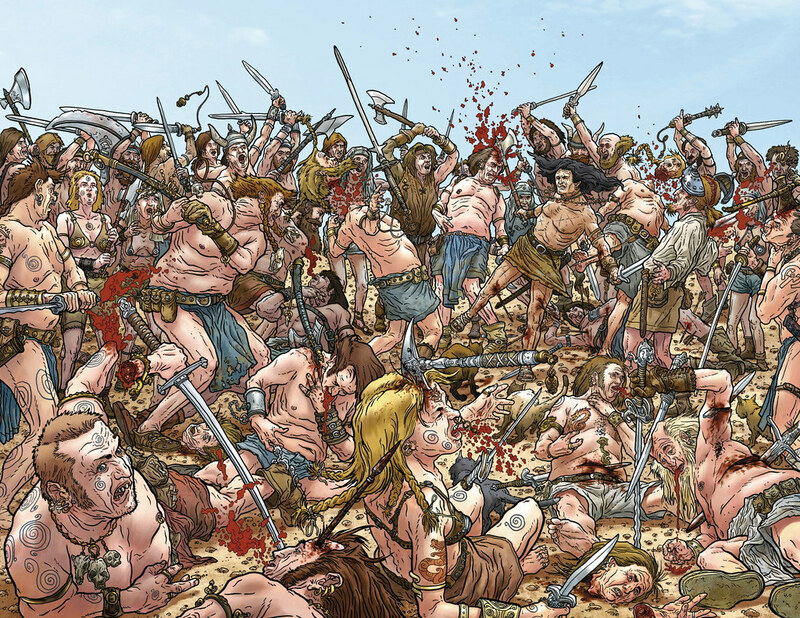 I see “Conan the Cimmerian” #25 as the latest chapter in a massive Conan graphic novel that includes everything from “Conan” #0 to “Conan” #50 to “Cimmerian” issue #s 0 to 25. When readers put down “Cimmerian” #25, I hope they feel compelled to go back to our Eisner Award-winning introductory “Conan” "zero issue" to start reading Conan's life story all over again. Seriously, why the cats? Nothing irritates me quite like the inappropriate Easter Egg. I can deal with ones that are inobtrusive, and once discovered, don't dominate the scene. But this - there are cats. On a battlefield. Why? Are you serious? This is the cover? I haven't looked at the Dark Horse site in a few months and yeah this guy can draw better than me, but I am seriously underwhelmed, this is just bad for so many reasons. That cover is just awful... so bad in fact that I almost like it. If a cat had been given a dagger and was depicted stabbing a flabby-breasted guy in the guts, it would have been perfect. But honestly, there's no realism to this thing. Conan looks like a colorform someone stuck on the battlefield. that has to be one of the worst covers I've ever seen..
See, that's the thing: it IS very nicely drawn, but the actual depiction is just wrong in every way possible. I can't help but feel the colouring kills it too: so bland and weak. Strangely enough, replace Conan with the aging Cohen from Terry Pratchett's Discworld books, including one of his buddies traveling about in a scythed wheelchair, and this would've been fitting indeed. It even LOOKS like one of the awful Corgi Discworld covers. Hey, I like Kirby's covers! I will say, though, it DOES remind me a lot of them, and it is more appropriate for Cohen and his Silver Horde than Conan. I'm at a loss. Is Geoff trying to be overly realistic, depicting the warriors not as physical, savage ideals but as the polar opposite? If that's the case, and Geoff's illustrating his take on what would likely be the actual dietary inadequacies, poor hygiene of the period as well as shortness of lives in such a setting, leading to really bad over-all health of the inhabitants.. well, this is still pretty extreme. Conan's alleged time period is often too idealized but this is so bad it's funny. It's certainly not in keeping with the visual diet we've come to expect. In that, and if that is the case, consider it a well point, depressingly made. Considering the fantasies that Darrow's indulged in the past I have to wonder why he needed to portray this image in this light? Perhaps this is penance? ...For us? Some artists repeatedly portray Conan not just as a fantastic figure but also like a guy who has his own gym, physical trainer, personal chef (with awesome protein shakes), waxing studio and tanning booth, dentist, physician, etc. This image is closer to a wandering merc, bandit and political rabble rouser who has none of that stuff. Indeed, Rick. Endeavouring to portray more "realistic" barbarians is a noble idea, but flabby old men who look like they wandered out of a nursing home is not more realistic, it's just another type of unrealism. At least you could believe the Greek Gods we usually have being formidable warriors.